Cutting edge vacuum generators, suction cups capable of solving any problem of handling, latest generation solenoid valves and efficient vacuum regulators are still not sufficient to ensure maximum sealing and the best distribution of vacuum. Vuototecnica knows that even hoses and fittings play a fundamental role in a vacuum system as they must ensure proper distribution of the flow of the vacuum source and an optimal seal. The line of flexible TPR hoses together with their RTPR fittings, with 2″gas 3/8″ full suction sections, were specially designed and manufactured by Vuototecnica in response to the needs of vacuum distribution, in cable holder chains, of various types of machines and manipulators. These hoses have excellent flexibility, ensure minimum radii of curvature and are very light given and in consideration of the important resistance to implosion demonstrated. The inside of the hoses is smooth to minimise pressure loss and can be used in all working environments, indoors or outdoors, thanks to the high resistance to abrasion, temperatures, atmospheric agents and to a significant number of the most commonly used chemicals. The flexible hoses for TPR vacuum are made with plastic insulating and self-extinguishing materials and also have an inner reinforcement core. 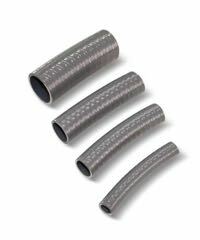 They are therefore more flexible and do not have electrical conductivity unlike the most common iron spiral PVC hoses. The latter are also more easily subject to breakage in cable holder chains precisely due to the voltage that is generated between PVC materials and the metal spiral. 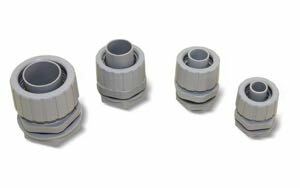 The accompanying range of RTPR fittings is made of self-extinguishing polypropylene up to the size of 1″ gas or nickel plated metal for hoses up to 2″ gas. They are very robust, offer an immediate perfect vacuum seal with simple manual tightening and may be opened and closed many times without risk of damage to the hose. They are unlike the most common push-in fittings with metal hose clamps that damage hoses resulting in the end user having to partially cut or replace the hose during inspection or maintenance. Vuototecnica TPR hoses and RTPR fittings: the best choice for long term sealing.